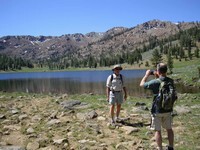 Photos by Dan and Jim W.
Another beautiful hiking day with the temperature climbing from the mid-60s to the mid-70s under a cloudless sky. 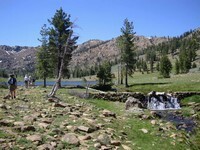 The TH is about 30 minutes past downtown Callahan which made the total driving time almost 2 hours. 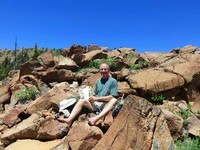 Although the driving time was longer than expected, we all agreed that this hike was a keeper, perhaps doing it again next year in a counterclockwise direction which would have the added virtue of getting almost all of the uphill out of the way before lunch. 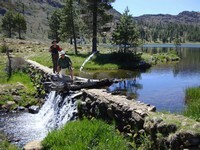 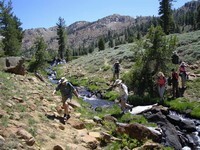 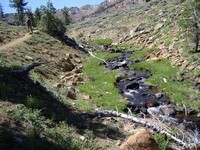 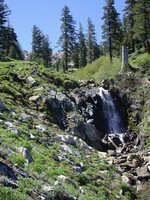 The hike begins with a climb up along East Boulder Lake Creek past a delightful small waterfall to East Boulder Lake. 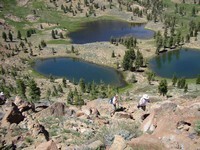 From there we climbed the east basin headwall past several several smaller unnamed lakes / tarns. 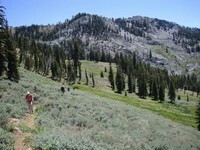 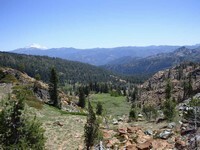 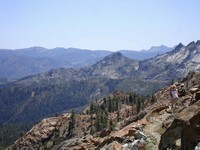 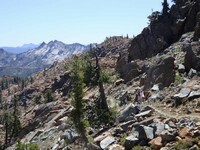 It was then up and over the ridge and then down to the PCT with great views to the east and south. 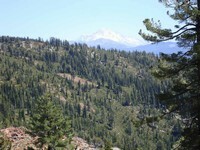 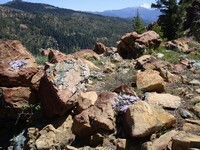 We followed the PCT around to a large rock outcropping where we had lunch with views of Shasta, Eddy, the still snow-capped Trinity Alps and Mt. 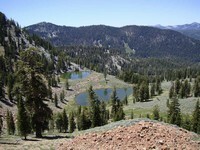 Lassen 84 miles to the southeast. 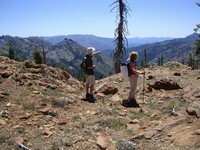 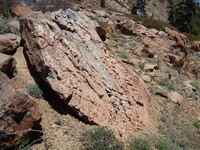 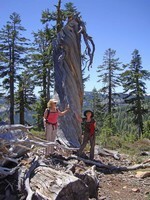 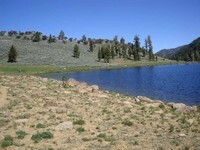 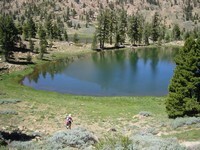 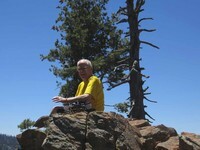 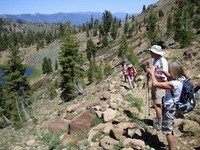 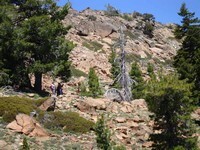 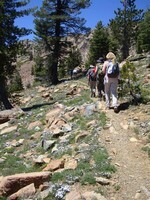 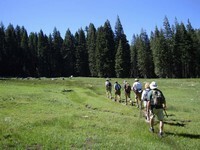 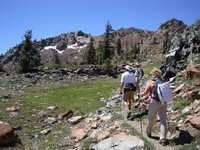 After lunch we continued on the PCT to its junction with the East Boulder Lake trail on the ridge. 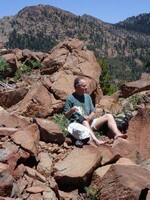 This would be the logical lunch spot if we do the route in a counterclockwise direction. 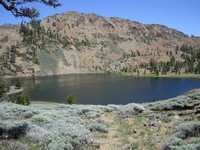 It overlooks a large valley with multiple small lakes / tarns. 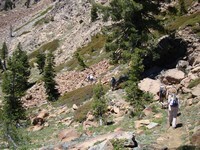 Dropping down the Middle Boulder Lake trail past Middle Boulder Lake we followed around and eventually crested the ridge on the west side of East Boulder Lake and dropped down to the lake and from there back to the TH. 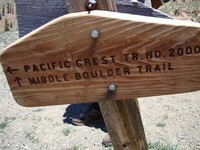 Total time on trail, including an Annie lunch, was 5.5 hours. 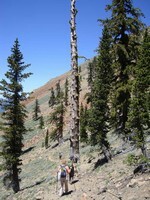 Poles are a useful addition for this hike. 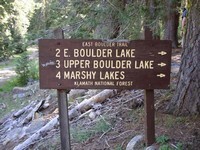 The boulder trails are aptly named as you are going up, down, over and around boulders on several trail stretches. 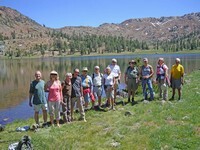 We took refreshment at Dottie's in Etna, which meets all of our high standards for food and drink.